Emory’s School of Nursing is ranked among the top 10 nursing programs in the nation by U.S. News and World Report. It is the top-ranked nursing program in Georgia. Interested in Registering for this Course? Registration for the "Introduction to Professional Nursing" course is open for spring 2016. Please contact forrest.james@emory.edu for more details about this course. The Nell Hodgson Woodruff School of Nursing will launch its first-ever "Introduction to Professional Nursing" course exclusively for Emory College of Arts and Sciences students in spring 2016. This new course will explore the multifaceted roles of registered nurses and nurse practitioners in today’s health care system. "We are delighted to offer this course to give students a glimpse into health care careers ranging from primary care and pediatrics to forensics and emergency care," says Angela Amar, assistant dean for BSN education at Emory’s School of Nursing. Students enrolled in the "Introduction to Professional Nursing" course will hear from health care leaders and will participate in patient care simulations in the School of Nursing’s state-of-the-art simulation lab. "This course will help students at Emory College preview nursing careers early in their college journey," says Amar. "Most students don’t realize that nursing provides an infinite number of career opportunities. Our alumni hold positions ranging from CEO and chief nursing officer at major health systems to public health nurses and clinical educators at community clinics." Nursing is one of the fastest growing careers in the United States and several cities across the nation — including Atlanta — are facing a severe shortage of nurses. "We need more nurses to deliver health care services to our population," says Amar. "I am excited that Emory will be at the forefront of helping to expose more students to the nursing profession." 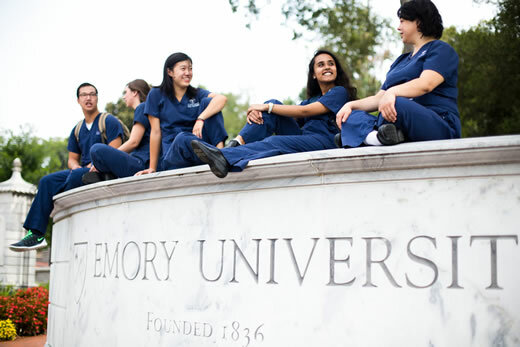 Emory's School of Nursing is ranked among the top 10 nursing programs in the nation by U.S. News and World Report. It is the top-ranked nursing program in Georgia.